Easter was never my favorite holiday. I have always had an aversion towards meat, for as long as I can remember. But only the idea that schools would be out, that I’d get to see all my summer friends again, that it would be Spring with poppies and chamomiles springing everywhere, and the sea right there beside me, was enough to make me look forward to Easter every year. Even if I didn’t get to swim, even if the color of sea did not exactly match that of the Summer – the sea of Spring is different, vaster, more lonely- the mere imagining of it made my heart race. Easter to my family – as to most Greek families- revolved around the meat. The lamb, the whole lamb, hung in the house upside down, draining its blood into a metal plate, never on the floor. And then, there were all these other things that gave Easter its fragrance: the intestines, the kokoretsi, the Easter soup. For two days the lamb hung there. For two whole days the house smelt of death and I would lose all the appetite I had for Spring and the sea, the poppies and the chamomiles. Every year I would pray for rain, so that our Easter trip would get canceled, and we would return to Athens, we would not have time to get the lamb, the butcher would show mercy and let it live. In Ikaria, during Easter, you will not see hundreds of lambs roasting in the yards. You will not smell the barbeques from miles. In some villages they even keep the custom of the memorial service. It’s an old custom, where all the village people (and everyone who may want to join them) gather together and share a meal in memory of their dead. Everybody has a seat at the table, the haves and have nots, and only those who can afford it, provide the food.It’s been four years now, from the first time I attended a Memorial on Easter day. I am glad that my dear friends invited me – they are those who resurrected the custom in Fradato – so I could see for myself what the Memorial was, share their joy, their food and wine. 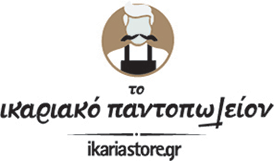 All together, Ikarians and strangers, Greeks and foreigners. And nobody forces me to eat the meat. They see in my eyes, that I simply cannot. That’s the only way I can experience Easter. At a Memorial Service of Solidarity, holding on to a never empting wine glass.